The autumn is here again and that means it’s time for all those hearty, warming meals. 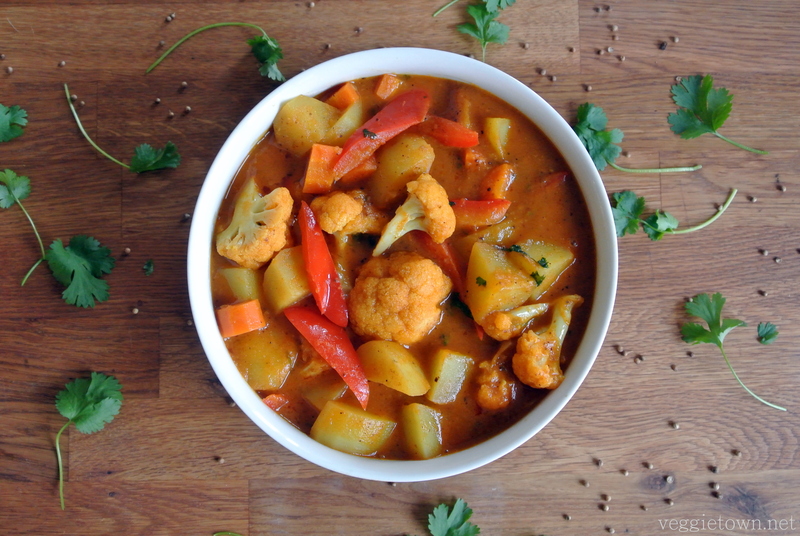 This vegetable curry is just that, hearty, warming and so delicious! 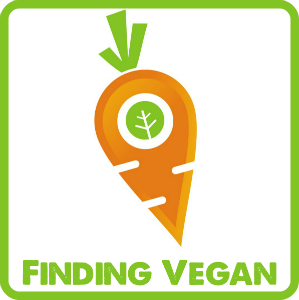 If you have read my blog for a while you probably know of my relationship with Indian food. I love it, sometimes have to much of it and sometimes need a break. But I finally always return once I realize, all over again, how incredible the Indian flavors are. I am so happy to share this recipe with you. It is one of my favorites and I keep cooking it over and over again. The base (sauce) of this curry is made of fresh tomato, onion, garlic, ginger and spices. You start by preparing the base and once that is ready you add the vegetables. You can choose any vegetables and/or pulses that you like. The great thing with this recipe is that you can prepare the base in advance and then finish it later by simply adding the remaining ingredients. This makes it perfect for dinner parties and such. 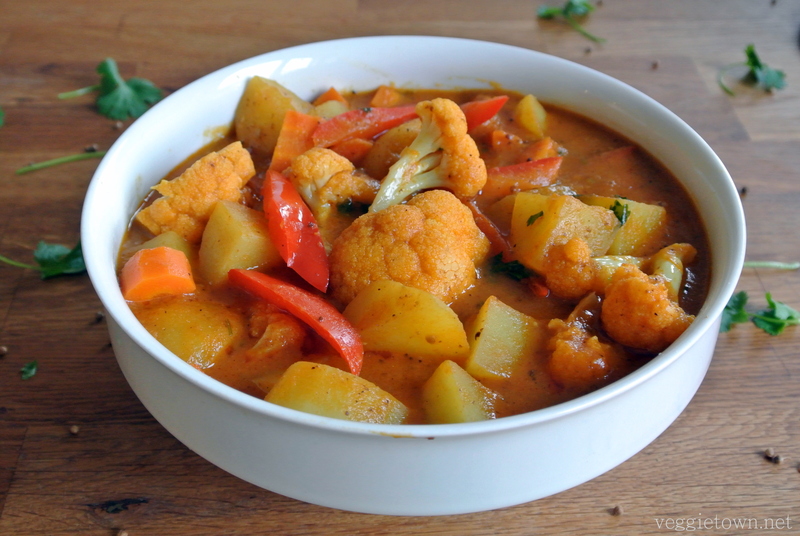 This vegetable curry is preferably eaten with rice. A few other things that are great with this dish are: apple chutney, fermented lime pickles and chapati. I hope you will appreciate this recipe as much as I do and that you will find your own perfect combination of veggies. Once you get the hang of the recipe, for the base or sauce, it could be fun to experiment a bit with the spices and see what other combinations works. Cut a cross at the top of each tomato and then place them inside a bowl or pan. Cover with boiling water and leave for a few minutes before you separate them from the water and carefully remove the peel. Chop the tomatoes and place the flesh, seeds and liquid in a small bowl. Set aside. Chop the onion, garlic and ginger finely. Measure up all the spices, except the garam masala, and set aside in a small bowl. Dice the potatoes, carrot and red pepper. Divide the cauliflower in small bouquets and split the green chilies lengthwise. Heat the oil in a wok and start by frying the onion. When the onion has become soft and golden you add the garlic and ginger. Fry until the raw garlic smell disappears and then add the spice mix and soon after the chopped tomatoes. Let it all simmer until the tomatoes are soft and squashy, adding a little water along the way if necessary. Transfer the mixture to a container and blend until you receive a smooth sauce and then transfer it back to the wok. Add the potato and a few dl of water to the sauce and let it simmer for 10 minutes before you add the salt and the rest of the vegetables, including the fresh chili. Let it cook until all the vegetables are tender, adding more water if needed, then stir in the cilantro and garam masala. Enjoy together with rice and chutney!